new campaign film titled “Embrace the Future”. 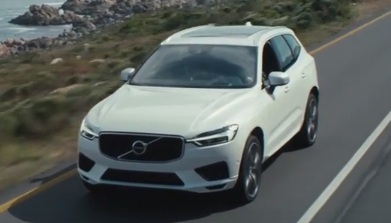 The extended spot (so far 30-second versions have been released) features a man driving along an oceanside road a white 2018 Volvo XC60 to drop off his wife, Victoria, who’s working as an astronaut on the “most expensive man-made object in the history of the world, going 24.000 miles/hour”, at a space station. On the way, he asks her if she’s nervous, but she doesn’t say anything, showing only a sly smile in response. “Well, they’re not gonna leave without you.” – he tells her, and then keeps driving. The woman’s voice is heard in the background, delivering an empowering and thought-provoking message. “Am I nervous? I do get nervous. And it’s ok. It’s only human. Nerves are a sign that you’re stepping outside your comfort zone. And that’s when you find out what you’re really capable of. It’s natural to be afraid of things you don’t know. It’s not ok to run away from them.” – she says, mentioning at this point her mother, who has always believer in her and never questioned her abilities or capabilities to achieve whatever she wanted. “The only thing that can stop you from becoming whatever you to want to be are the limitations you put on yourself. (…) The Universe is big, but we are bigger. (…) There are two types of people in the world: those who fear the future and those who embrace it. The future is for the unafraid.” – she adds, before the tagline “Embracing the future. The all-new Volvo XC60. Our idea of luxury” appears on screen. studio album, “Harlem River”, released in 2013.